I have never been lucky when baking breads with yeast and whole meal flour. I just don't get it right, or perhaps those two ingredients are hard to become friends in general. I don't know. I actually gave up on it. 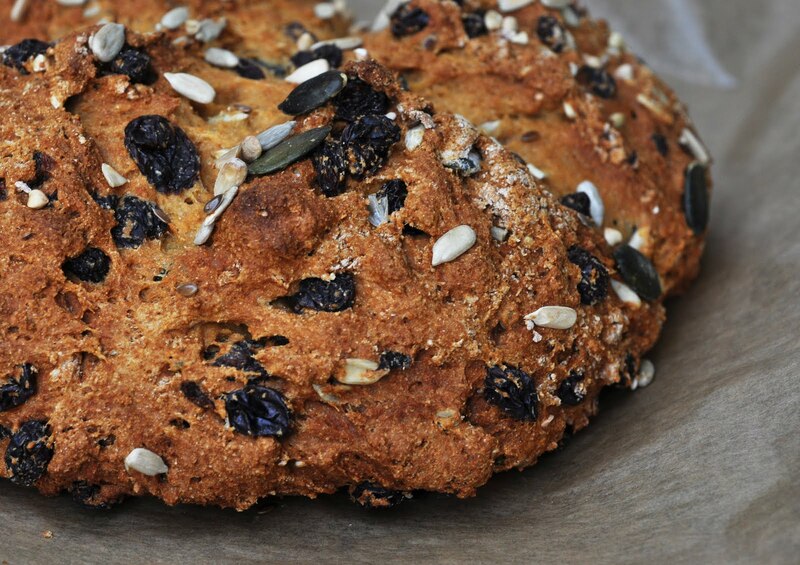 Therefore, for quite some time, I had planned to bake a sweet soda bread with whole wheat flour. As these breads have to be eaten as as fresh as possible, actually even warm straight out of the oven, I found the perfect occasion when a friend announced she would come over with her kids the same afternoon. The base of this bread is that of a typical Irish soda bread. 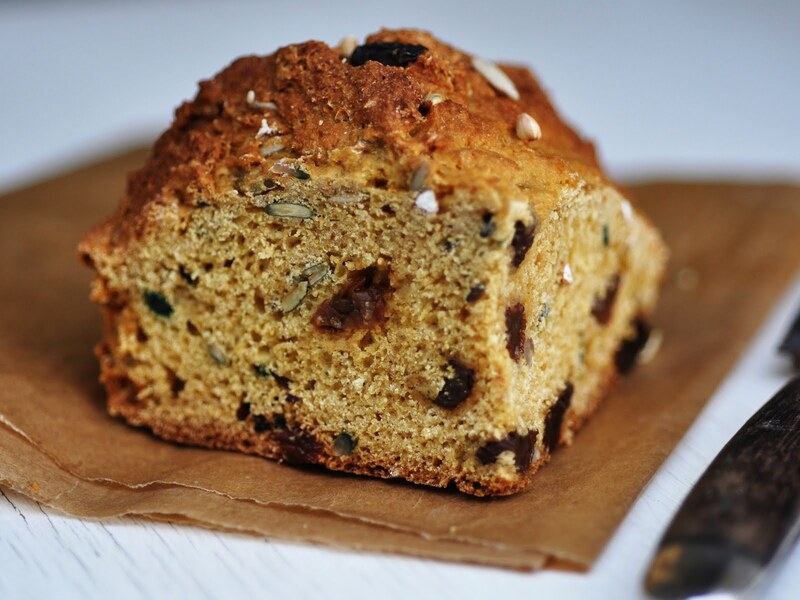 I sweetened the dough with a little agave syrup and threw in some raisins to make it a coffee-cake-style bread. Just without the butter that distinguishes bread from cake. It was delicious plain as long as it was still warm, a little later some butter on big chunks just torn off the the bread were as good. I have realized that I like the rustic kinds of breads and cakes, the outdoor and kids friendly no-fuss on-the-go stuff. This one was 100% my kind of style, naturally sweetened with dried fruit and agave. The seeds can easily be substituted by chopped nuts of your choice. In a small bowl, pour boiling water over the raisins and let sit for 10 minutes, until raisins have plumped up. In a big bowl, combine flour, salt and baking soda. Mix well. Stir in 4 tablespoons of toasted mixed seeds. In another bowl, combine agave syrup and buttermilk. Combine wet ingredients with dry ingredients. Knead the dough a few times. Drain the raisins, then fold them into to the dough. Knead in until evenly spread. Form the dough into a round log, cutting a deep cross into the middle. Sprinkle the remaining seeds over the log. Bake for 30-35 minutes. Let cool on wire rack. Serve as fresh as possible.